A new study finds Virginia has lost $280 million in total property value from 2005 through 2017 because of sea-level rise. 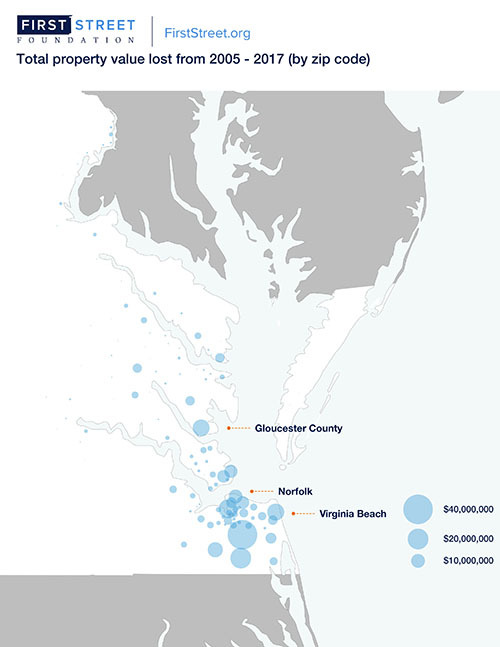 The report analyzed home values in eight coastal states, including Virginia. It was conducted by First Street Foundation, a New York-based nonprofit dedicated to addressing the impacts of sea-level rise. The foundation said coastal flooding had affected 47,035 properties in Virginia. The study found sea level rise had reduced the value of 819,526 properties by $14.1 billion in eight states. In addition to Virginia, the foundation analyzed Georgia, Connecticut, New York, North Carolina, South Carolina, New Jersey and Florida. The foundation offers a flood-risk tool, Flood iQ, which allows users to find property-specific value loss and the aggregated loss for their city. The study was conducted by Steven A. McAlpine, head of data science at First Street Foundation, and Jeremy R. Porter, a Columbia University professor and statistical consultant to the foundation. The analysis is an expansion of their peer-reviewed study on how home values in the Miami-Dade County, Fla., market have been affected by sea level rise. They analyzed 9.2 million real estate transactions and extrapolated those results to 20 million values. Researchers isolated sea level rise by controlling for economic trends such as the 2008 recession and comparing similar properties whose main differences were home or road flooding. The foundation plans to expand the research project to all U.S. coastal states by the end of the year.